Is A Hidden Virus Making You Sick? Over 95% of adults have evidence of viruses in their blood, and many of these viruses have been shown to correlate with autoimmunity. But how do you know if this is something that requires treatment or not? Today we delve into a responsible approach to viruses with Dr. Nick Hedberg to answer this question. If you think you need help detecting a virus, click here. Hey, everyone. Welcome to Dr. Ruscio Radio. This is Dr. Ruscio. I am here with my good friend, Dr. Nick Hedberg, who, gosh, we met, man, maybe five years ago. And we’ve stayed in touch over that period. And a really, really, really sharp functional medicine doctor, one of the people—I don’t respect a lot of functional medicine doctors, unfortunately. But Dr. Hedberg is definitely one of the people that I really respect, value his opinion. I think he has a very practical approach to things. And so I thought it’d be fun for us to talk about all things viruses today. So, Nick, welcome to the show. DrNH: Dr. Ruscio, thanks for having me. Appreciate it. DrMR: Absolutely. Do you want to tell people a little bit about your background before we jump in? 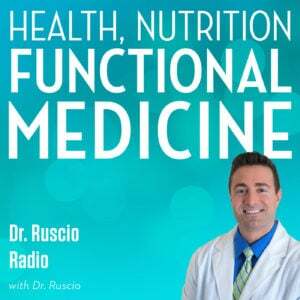 DrNH: So I’ve been in practice 13 years now, practicing functional medicine. Mainly autoimmune is really the main thing that I see—a lot of autoimmune thyroid disease and other various autoimmune conditions. And that’s kind of the bulk of the practice. It is an internationally based practice where I do a lot of Skype consultations worldwide. DrMR: Cool. And you have a number of—well, you’ve written, I guess, two thyroid books. You had a version from before and then a somewhat recently released version, and a blood chemistry book. And you have a training course in essentially infectious disease like Lyme, Lyme co-infections, and viruses. Anything else major there that I’m leaving out? DrNH: Those are the main things, the two thyroid books. The most recent one is The Complete Thyroid Health and Diet Guide. And then, like you said, TheInfectionConnection.net. And then I’m going to be launching The Hedberg Institute, which is HedbergInstitute.com. And that will be a major online functional medicine education hub. So that’s what I’m working on right now. DrMR: Nice, nice. And with The Infection Connection, a course that you do, I actually went through that course a number of years ago. I thought it was a great course, especially if you wanted to get more into Lyme, Lyme disease co-infections. It’s a well-rounded model. But those are the things that I got the most out of because those were the areas I was looking to learn more in a few years ago. But there’s also a section on GI and organic acid analysis. The segue topic here is into viruses. And so why don’t we start off with a little bit of a conversation on viruses, because what I see with different patients is depending on who they go to—and oftentimes if they go to a natural provider or a natural doc like N.D.s or different providers that are practicing functional medicine, it’s almost uniform that people are being told they have Epstein-Barr virus infections or reactivations or whatever you want to call it. So people very commonly think that they have this. And oftentimes when I look at their lab work, they don’t really have the pattern that is usually suggestive of reactivation. And so a lot of patients think they have this. Some really may. But some, it may be a misread of the labs. So Epstein-Barr is one. But there are a number of viruses. And I think there’s a lot of confusion around viruses. And so I’d like to maybe help give the audience maybe an updated a view, a little bit more of a responsible view on viruses—not to make this an “everyone has a virus, no one has a virus.” What can we do to try to look at these things a little more critically and to figure out if this is something that we need to look into? So some of the keynote viruses that come to mind in the functional practice model would be Epstein-Barr virus, cytomegalovirus. There are a few different strains of herpes simplex virus. There’s parvovirus. I think those are the big ones. And Doc, you may want to add to that in just a second. But there are also several gastrointestinal viruses, some that are self-limiting like norovirus and rotavirus. These are things that can just cause short term diarrhea. And then your body gets over it, and it’s not a big deal. So there are a lot of viruses. But I think there’s a handful that are focused on clinically in functional medicine—Epstein-Barr, cytomegalo, some of the herpes simplex, parvovirus. Anything you want to add to that, Nick? DrNH: No, those are the main ones. When we talk about a lot of those viruses you mention, they’re pretty much all in the herpes family other than the parvovirus and the GI viruses. And you can never get rid of a herpes virus. It’s always there. So the question is why is it causing a problem? Why is it reactivated? And is that even a problem? And most people are really overly concerned about the virus. And treating it doesn’t really work. It might deactivate. It might go away for a little while. But it usually ends up coming back. DrNH: Either—any kind of trauma as a child. What the research is showing is that the more traumas and abuse, whether it’s physical or verbal abuse as a child, we actually see increased levels of inflammation as an adult. We also see major, major stress physiology issues. And so glucocorticoid resistance is basically, to help everyone understand, just chronic elevations in cortisol from stress—and this can be constant, or it can be surges over and over again like stressful job, abusive boss, stressful relationship, just all the possibilities in life. And unfortunately, cortisol receptors start to down regulate. They just don’t respond anymore to cortisol like they used to. And that creates a lot of inflammation. And then, as you know, cortisol is extremely important for the immune system. So they just won’t be able to control and fight off these chronic viruses because of that glucocorticoid resistance. DrMR: Yep. Definitely stress is one of the most foundational pieces of getting someone healthy. And as you’re saying that, it reminds me of this Asian study that I read where the higher the level one’s socioeconomic stress, the higher the incidence of Epstein-Barr virus reactivation. And I share this with my patients oftentimes who think that there’s this—you have to really go in and treat this directly. And usually, my commentary is let’s focus on the foundational pieces first—diet, lifestyle. Usually, gut health also is pretty high on the list. And then let’s reevaluate because all those things will do an immense aid in decreasing the stress on the body. And as you’re saying, then it would stop this propagation of glucocorticoid resistance and all the amino suppression that can happen secondary to that. DrNH: Yeah. That’s exactly right. And so we’ll do—meditation is really at the top of the list as far as long-term resolution of these herpes viruses. That’s a big one that helps a lot. Recently, I’ve been recommending journaling because there’s a lot of research coming out on journaling as far as its effect on inflammation and stress physiology. So those are two good ones that really help. But specifically, the Epstein-Barr virus, for example, it is beneficial to address that, not necessarily overly aggressively. But you do get much more synergistic, more rapid results if you at least do something regarding that virus while you’re also working on the foundational aspects. Those things tend to really overlap anyway. Same thing with cytomegalovirus. And then the other herpes strains—everyone knows about chicken pox, which is a herpes virus, and then that reactivates and causes shingles. And that usually happens when the immune system is severely compromised. DrMR: Right. And I definitely want to jump more into testing and some treatment protocols directly for viruses in a second. But there are a few things before we go there. And I should mention—you already said this. But just in case someone listening to this is new to this conversation, these herpes family viruses, as Nick mentioned a moment ago, you never really get rid of. And so it’s normal for 95% of the adult population to have evidence of Epstein-Barr virus in their blood. So it’s normal. And it’s just like Nick just said also, chicken pox—you get it as a kid. And then it’s never really an issue except for if later in your life you’re really immunosuppressed. And then it can come back as shingles. So it’s not an issue of eradicating these things or trying to have no evidence of them in your body. But it’s rather just making sure that then immune system is doing a good job of being able to hold these things in check kind of like a proverbial jail cell, I guess you could say. These things need to be kept in the cell by the guard, which would be your immune cells. And, Nick, there’s one thing I wanted to ask you because I know you’ve been doing some more of the advanced cortisol testing because you mentioned glucocorticoid resistance as being a problem. And when I was running the various adrenal stress index tests, it was almost uniform that people were coming back with low cortisol. But I’m thinking that—I’m speculating, guessing that what you may be seeing when you’re running these more detailed cortisol analyses is that total cortisol production might be low, but their clearance of cortisol might be very low also, leading to a high level that can influence the receptors. I’m assuming that’s what’s happening. But do you have any—have you gleaned any insights from doing that testing? DrNH: Oh yeah, definitely. One of the unfortunate things out there is salivary cortisol testing, which is going to give you maybe 5% of actual cortisol production, usually less than that. And with the urinary profiles, you get to see the metabolized cortisol, which is really the bulk of cortisol production. It’s just a much better indicator. And unfortunately, that doesn’t really tell you much about the receptors. So a lot of it’s just going on the patient history. But it’s pretty clear. We’ll see very high levels of metabolized cortisol in these chronically ill patients with chronic infections and inflammation. And there are a number of factors that will affect the clearance. Like hypothyroidism, you’ll see poor metabolism of cortisol, insulin resistance, inflammation. Those are really the big ones. But yeah, definitely connections there with chronic viral activity. DrMR: Gotcha. And some of what you’re saying—I don’t know if you practice differently, but I’ve been really just shying away from the cortisol and the adrenal testing because so much of a patient’s symptoms and other foundational health issues will give you the answer to resolving all of the symptoms that seem to be associated with chronic stress physiology. So to me, I’ve done a lot less of it because we know that all the, again, foundational factors we’re going to go through are going to help immensely with stress physiology. So I’ve definitely been leaning away from it. And I think some of what you said reinforces that, which is looking at the person rather than just the lab value. DrNH: Yeah, you can’t really do—if you just do an adrenal profile without organic acids which organic acids, just so people know, give a tremendous amount of information about overall metabolism including catecholamines, norepinephrine, epinephrine. And that is the other part of the adrenal gland. And so if you’re just looking at one, you’re not really seeing the whole picture because you may see very low levels in one area and then catecholamines either very high or just kind of burned out in others. DrNH: So that’s another piece that needs to be looked at. DrMR: And I think this would be a fun topic for us to maybe do a follow-up podcast on specifically because there are just a flood of thoughts that run through my head. For example, when we look at all the research on the adaptogenic herbal supports for the adrenals, none of those studies have treated based upon lab values. They were just giving people who were stressed out these herbs. And they’ve noted fairly consistently improvements in all different sorts of parameters—subjective wellbeing, energy, vigor, decreased anxiety, increased cognitive performance. So again, I think why the salivary cortisol tests were a really good idea out of the gate, maybe 10 years or so ago. But now that we’re learning more, I think we need to refine that model a little bit. But let’s transition out of that because I know we could talk about that all day. And I think we should definitely do a follow-up on that. But how about the testing interpretation? Because I have to admit that this is one area where I’ve been searching in the studies for consistency. And even in some of the best review papers, the most thoroughly performed review papers I’ve read, I haven’t been able to tease out any consistent “this is what positive means.” In fact, even if you look at LabCorp’s interpretation guide, it’s different than Quest’s interpretation guide. And just for Epstein-Barr virus interpretation. And I believe it’s Quest that essentially looks at a fraction. So with Epstein-Barr virus, there are a number of fractions you can test for. And I actually have to credit you, Nick, with initially making me aware of this. But there are a number of fractions like early antigen, viral capsid antigen, nuclear antigen. And depending on which of those are high, then that gives you a pattern. And that pattern can be interpreted as reactivation or just latency, meaning it’s kind of being held in that jail cell. And oftentimes, it’s the early antigen fraction that’s looked at to denote if there is reactivation or not. But even between LabCorp and Quest, the two biggest reference labs in the country, they’re not even in agreement on that. And then you see other studies looking at things like the viral capsid antigen. And they’re just using the IgG fraction of this marker, which, in many cases, denotes just latency. But they’re showing if that is high, then that correlates with different types of autoimmune diseases or fatigue. So I have not been able to get a solid consistency out of any of the literature on this. So I’m dying to hear what your thoughts are. DrNH: Right. So of all the papers that I’ve read, the vast majority of them point toward LabCorp’s analysis. The fact of the matter is that pretty much—unless someone hasn’t been exposed, the viral capsid antigen and the nuclear antigen, those are going to be high in pretty much everybody. It’s going to be really rare where you don’t see both of those elevated. DrNH: And the best thing to do is to just pick up the phone and talk to a pathologist who specializes in infectious disease. And that’s where you’re going to really get the most amount of information. And LabCorp, they do provide that if you do want to talk to the pathologist. And like I said, more specifically in infectious disease, they’re just going to be the real experts in that area. DrNH: And that particular analysis is the one that I use for LabCorp. And it’s the one that has really stood the test of time clinically which is the main thing that I’m concerned about when I’m trying to figure it out. So chronic fatigue, inflammation, swollen lymph nodes—if the autoimmunity has flared up, so to speak, and things like that. There are definitely direct correlations there with that particular analysis, specifically the early antigen-IgG which is really what I follow as far as reactivation and then deactivation. DrMR: Okay, so again for people listening—and I have to say I’m in complete agreement with that because that seems to be—the majority of the evidence I’ve seen has been pointing at that. But it is disconcerting that there’s just not very much consistency in the published research papers. But for people listening, the early antigen or EA-IgG fraction is probably the most important to look at. If that’s elevated, that is what really denotes Epstein-Barr virus reactivation. What about cytomegalovirus? DrNH: Right. So it’s a different panel, of course, than the Epstein-Barr. And you can do IgG, IgM. And you can do PCR. PCR will obviously give you a very direct view into its activity in the blood. PCR is just mainly looking at the actual DNA of the microbe of the virus. I don’t really use that. I just use the IgG and the IgM. And the thing about IgM is that on average it only really hangs around for about seven weeks on average. And so I will look at the IgG titer, how high that is. Obviously, if the IgM is positive, then it’s pretty clear. DrMR: But that’s rare, yeah. DrNH: Yeah, and then the IgG, we’re looking at that titer. And then of course, looking at symptoms as well. There are so many symptoms related to cytomegalovirus. Just some basic ones—if someone has muscle pain, that can actually be an indicator that it has reactivated—muscle pain, muscle twitching. And then if you’re seeing anybody young who has inflamed salivary glands, the parotid glands, a lot of times that tends to be viral as well, either cytomegalovirus or Epstein-Barr. DrMR: Right. Yeah, the proverbial kissing disease, right? DrMR: And I think we mentioned this, but just in case we didn’t mention this—Epstein-Barr virus is the virus that causes mononucleosis. So that’s how it can manifest. It’s a more severe manifestation. There are many people that will never have mono, of course, and will have Epstein-Barr virus. But if you end up acquiring Epstein-Barr virus or coming into contact with it for the first time maybe when you’re under a lot of stress or what have you or if your immune system is just not super strong to begin with, then you may be one of those young adults that ends up with mono. So in terms of the significance, this is another area that I think is very interesting because we see a lot of correlation data. But I haven’t really been able to find much, if anything, in the way of treatment data, meaning we see high Epstein-Barr viral titers in those with Hashimoto’s. And then we treat those patients for the virus. And then their antibodies decrease. But we can’t dismiss it because I just don’t think those studies have been done. For a long time, I think, with gastrointestinal health, we’ve thought that by treating gastrointestinal infections, we could help with autoimmunity. And we’ve just started to see only a couple studies showing that the treatment of gastrointestinal infections actually helps with autoimmune conditions. So it’s not to say because there are not studies showing that treating viruses can’t help with autoimmunity, that when they are done, they’re not going to show benefit. But it also gives me a little bit of pause with how quickly I will rush into jumping on treatment for a virus. So how do you look at the significance, Nick, in terms of trying to qualify is a virus an issue? Is it maybe noise? How do you sort this all out? DrNH: Right. So my main concern is the clinical picture—how the patient is feeling, their signs and symptoms, looking at their blood chemistry. I’ll give you an example. Let’s say I’m seeing a woman who has a ferritin of 10, and the Epstein-Barr virus is reactivated. You’re not really going to get very far treating the virus with a ferritin of 10. For those listening, ferritin is just how much iron is stored in the body. And you can have very low iron stores but not even have signs of anemia. And so that’s one example of something where our focus is going to be more on rebuilding iron stores rather than aggressively addressing the virus. DrNH: Because there are so many different possibilities there. I hear what you’re saying because you have to start somewhere. DrNH: But that would be one example. There are cases where things just seem to be in place, so to speak. There isn’t much else showing up other than just the virus. And that could be genetic with a CD8 T-cell deficiency. Those are the cells that really control the Epstein-Barr virus. And so the focus may actually be more on immune system function rather than directly targeting the virus itself. And then there is going to be overlap in a lot of those. For example, selenomethionine is highly effective for the Epstein-Barr virus. But it’s also effective for Hashimoto’s. DrNH: It’s a good anti-inflammatory, good for the immune system, etc., etc. DrMR: Yeah, and that’s just a form of selenium, for people listening. So yeah, and that’s why I think we are in agreement on so many points is because we’re a bit practical in our way that we practice. And I would say I’m similar. Usually what I will do is, of course—level one would be all the foundational dietary and lifestyle issues. And then level two would be our initial phase functional medicine evaluation, I guess you could say, which would be your blood chemistries where you’d be looking for things like low ferritin, anemias, over hypothyroidism, any other funky liver/kidney things going on. And then usually, it also consists of a pretty good GI workup. And after that is when, if the patient is still not well, A, and they also have these persistent signs of Epstein-Barr virus or another virus reactivation, then that’s when we would use some kind of targeted anti-viral therapy or consider a targeted anti-viral therapy. And I should, maybe as a transition into some of the anti-viral treatments, mention that some of the natural agents, I think are positioned to be pretty powerful and pretty helpful in this regard. There was one paper. And I’m sorry for people who are wanting it. I don’t have the reference off the top of my head here. I won’t be able to put it into the notes. But there was one head-to-head trial looking at, I think it was acyclovir compared to melatonin in the treatment of oral herpes virus. And the melatonin was equally effective as the prescription acyclovir drug if not slightly more effective. So it’s certainly not to say that if you’re struggling with being able to get over a virus that you need a stronger—like a drug is going to be so much stronger that it’s going to produce the result. Certainly open to that. I definitely do not have an anti-drug framework. But I think it’s also important that we look at these things practically and say if the treatment’s not working, maybe it’s just the wrong treatment because some of the natural agents, I think, are pretty powerful. And they also have synergistic, or what I like to call side benefits rather than negative side effects like some of the anti-virals may also be, like you had just mentioned, Nick, also good for thyroid autoimmunity. Or they may also be anti-fungal or antihistamine. So with that, do you want to segue into some of the viral treatments that you use? DrNH: Yeah, so let’s just say we have someone we know for sure that there’s Epstein-Barr, cytomegalovirus reactivation. I mentioned the selenium, the selenomethionine. But one of my favorites is really going to be monolaurin. And monolaurins, some good research on that, highly effective for a variety of different viruses, especially the herpes virus. I’ve got a nice paper on that that I can send to you if you want it, if you don’t have it. DrMR: Yeah, please. We’ll put it in with this transcript. DrNH: Yeah, it goes through monolaurin, where it comes from—mainly in coconut and breast milk. Those are kind of the main sources of monolaurin. It’s a fatty acid ester. And basically, the easiest way to say it is it de-cloaks the virus that is enveloped in fat, exposes it to the immune system so it can identify it, target it, and fight it. And then it also has immune supportive effects as well. So it’s de-cloaking the virus, and it’s supporting the immune system to fight it. This tends to work well for the vast majority of people, number one because it’s not an herb. And you don’t always know how someone’s going to react to an herbal medicine. Some people just don’t do well with certain herbs. Herbs have a lot of different properties and things like that. Whereas this is going to be fairly benign, very, very few side effects if ever. I can’t even remember in the last 13 years a patient that couldn’t take it as directed. DrNH: And it just works so well in that regard while we’re doing everything else. DrMR: And it also has anti-fungal characteristics also, right? DrMR: Yeah, yeah. Any other ones that you want to go into? DrNH: So curcumin—there are actually some good studies on curcumin and the Epstein-Barr virus. So that might be another one that I’ll use. Vitamin C—the studies on vitamin C and Epstein-Barr are intravenous, but oral intake of vitamin C can really help. Reishi mushroom extract—that’s been shown to be effective. So there are a lot out there. But those are some of the top ones. DrMR: Yeah. And maybe for the practitioners listening, I know people like to have a protocol. But I would suggest that it may not be—there’s not maybe a magic protocol is what I think Nick is trying to say. There are a handful of good anti-virals. Use those. And then if things aren’t working, there’s probably something else that’s being missed. DrNH: Yeah, the other thing I would say is that one of the things that’s really overlooked is zinc deficiency. They just won’t really be able to fight off the virus if they’re zinc deficient. And most chronically ill people are zinc deficient. For those listening, the thymus is a gland in the chest area. And it’s where a lot of your immune cells mature. They grow and become strong there. If you’re zinc deficient, the thymus will actually atrophy, which means that it just gets smaller and smaller. And so it just makes it very difficult to fight any type of infection with a zinc deficiency. DrMR: So what do you see in terms of a typical response? And again, this may hard. I know it’s a very broad question. And there is probably a lot of individual nuance to this. But do you have any thoughts on a typical response? And the reason why I ask this is because in my mind we have the presentation of the patient. That gives you a certain idea. And then we can use lab work to reinforce that idea that we have. But then there’s another piece to this that, in my mind, is equally as important as the other two, or almost equally as important, which is the response to the treatment. It’s an important part of the clinical process for me to see a patient responding to a treatment to tell me that we’re doing the right thing, we’re moving in the right direction. So again, I understand this is a really broad question, but is there anything that comes to mind in terms of things to be on the lookout for that would suggest that this is a good response compared to a bad response? DrNH: Right. So we’ll usually repeat blood work after about three months of treatment. We’re looking at the CBC (the complete blood count). That’s really the best picture of the overall immune function. So we’re looking for improvements in that. We’re looking for markers of inflammation to improve, C-reactive protein, sedimentation rate, things like that. Then you can test the viruses directly. Clinically, if they do have an ongoing virus, there is going to be chronic stress there—usually unrefreshing sleep, slow starter, slow getting going in the morning, any kind of muscle pain, joint pain, brain fog, headaches, anything we can look at related to inflammation clinically and looking at symptoms. That’s a really good indicator as well as far as their progress. DrMR: Sure. That makes total sense. And my preference is to usually start—if we find evidence of a viral problem and evidence of a gastrointestinal problem, we typically start with the gastrointestinal problem first. Would you agree with that or have any thoughts on that? DrNH: Right. So yeah, 70% approximately of the immune system is in the GI tract. And the microbiome is going to have significant roles in overall immune function and inflammation. And so, yeah, that’s definitely at the top of the list. Small intestinal bacterial overgrowth tends to be a big issue, dysbiosis. Any kind of infection there can be really problematic and contribute to the glucocorticoid resistance, the inflammation, and the weakened immune system. DrMR: Sure, sure. Cool. So Doc, any other stuff on the topic of viruses that you want to share? DrNH: Just for everyone listening, the amount of research that comes out on a consistent basis on this topic, especially with the connection with Epstein-Barr, cytomegalovirus, and other viruses, and their connections to autoimmune disease, chronic illness, neurodegenerative disorders, it’s unbelievable how much comes out on a regular basis. So it is out there. Researchers are talking about it. Unfortunately, conventional medicine doesn’t really have much to offer to address these viruses or how to really work up a patient like you and I do. So what I would say is in the future, I’m going to predict there’s going to continue to be a lot more research on this. And hopefully, people will start talking about it a lot more because it is arguably one of the most overlooked aspects of chronic illness today. DrMR: And I’m hoping that maybe even someone out there listening will be one of the people to finally document the clinical effect in terms of benefiting autoimmunity that can be realized after treating a viral infection. I think these studies need to be done to really help bring this type of work more into the main stage. So if anyone is listening, is plugged into research, I think this would be a great study to do. So Doc, where can people track you down, read more from you, hear more from you, all that good stuff? DrNH: DrHedberg.com. That’s my practice website. And there’s the InfectionConnection.net. That’s the online education course in infectious disease, a lot of the stuff we just talked about. And then the new HedbergInstitute.com—that’s the new project which is comprehensive, online functional medicine education. DrMR: Nice, nice. All right, my friend. Well, I think that wraps up this issue. Let’s try to get something in the books maybe to talk about cortisol testing at some point in the future because I think that’d be fun. DrNH: That’d be great. Thanks for having me on. DrMR: Absolutely, Nick. Thanks for taking the time, my friend. Talk to you soon. On one hand, viruses seem like ‘opportunistic agents’-taking ground when/where they can (e.g. stressful situations). What percent are asymptomatic who have EB, Lyme, etc? And what makes them so? Adaptogenic herbs can/will often lower cortisol so if a person has low levels to begin with, wouldn’t they be contraindicated? (e.g. Relora, etc). What a timely/perfect choice in terms of topic. Thank you Dr. R.
Your first question is very hard to answer. Adaptogens are corrective, they increase low cortisol and decrease high. Thanks! I also was under the impression that being adaptogenic in nature, they would rise or lower levels as appropriate. I have not found this to be the case. In light of that, I found Dr Hedberg’s comment regarding the lack of consistency/reliability (with his patients) as a therapeutic agent very interesting. Yes. No way to do a double blind on the first query. More interested in seeing if you had any insight from patients who deactivated EBV/Lyme. Great article. Unless I missed this detail, in the study you reference we don’t know if the “lowering” was corrective or not. But the fact that the subjects had improvements in their symptoms we can assume the lowering was a good thing. Some adaptogens also have antiviral activity. In my opinion adaptogens would not be contraindicated for anyone with EBV reactivation. I have seen EBV deactivate while on adaptogens yes. Hope this helps! What basic labs are good to ask for? It is hard to find a good practitioner, even more concerning that you mentioned in the article that you don’t respect a lot of functional medicine doctors. Dr. Hedberg mentioned that there are rarely side effects to monolaurin, just curious why a lot of people claim to have detox when taking lauricidan? He also mentioned seleniomethionine is a good supplement, how much of the methionine gets in your system? Wasn’t sure if that was good to take if your methylation was broken down at certain parts in the cycle. The lab question is a bit to broad to answer here, sorry. Find a good doc and follow their lead. I’m not sure on the lauricidan. All good questions but difficult ones to answer. Sorry not to be more help! Just wanted to say this was a great podcast. It would be awesome to hear more from Dr. Hedberg, Dr. Nelson, or Robb Wolf. I also really enjoyed your conversation with Melissa Hartwig. Maybe you could get Dallas on here sometime. Anyway, I’m doing great now that I upped my B12 injections. All of the symptoms I was experiencing have dissipated. I was unable to get a appointment with Dr. Gordon in timely manner. So I decided to hold off for now. Then out of the blue I completely ruptured my achilles doing some sprints. Surgery is scheduled for this Thursday. Any tips for after surgery as far as gut health/pain management? I look forward to the next time we can chat! I’ll keep you in the loop. All great suggestions, the challenge we are having now is finding the time to get all the people we want in with only 1 show per week! Glad to hear you are doing better and bummer on the Achilles! Up for your dose of probios and this will help your MB rebalance more quickly. Hope this helps! Talk soon!